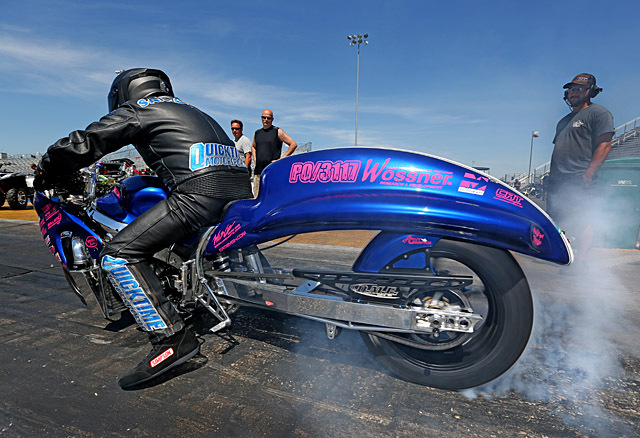 America’s fastest growing motorcycle drag racing series—NHDRO—launches its 2018 season in enormous fashion with the 190hookup.com NHDRO Season Opener/Last Man Standing Grudge Spectacular. 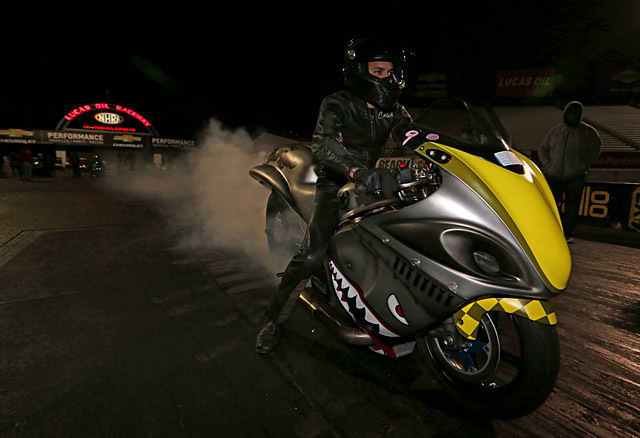 And it all happens at one of the most legendary and popular motorcycle drag venues of all time— Atlanta Dragway in Commerce, Georgia. But few in the days when AMA/Dragbike and Prostar packed the stands in Atlanta could have imagined anything as audacious as the Last Man Standing Grudge Spectacular. Sixteen of the nation’s gnarliest Performance Racing Products grudge bikes square off Saturday night in a blind draw, winner take all, $13,000 battle to the end. 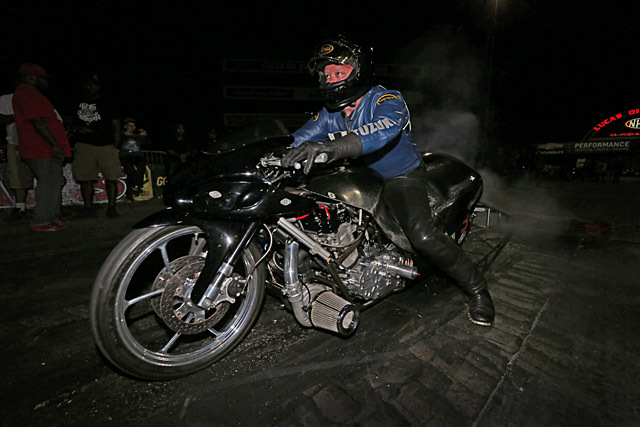 This event is so monumental that rider Keith “Shine” Dennis and builder/tuner Joe Marasco of MSP—perhaps the most legendary duo in the history of motorcycle grudge racing—have put their feud aside and will compete as a team for the first time in over a decade. 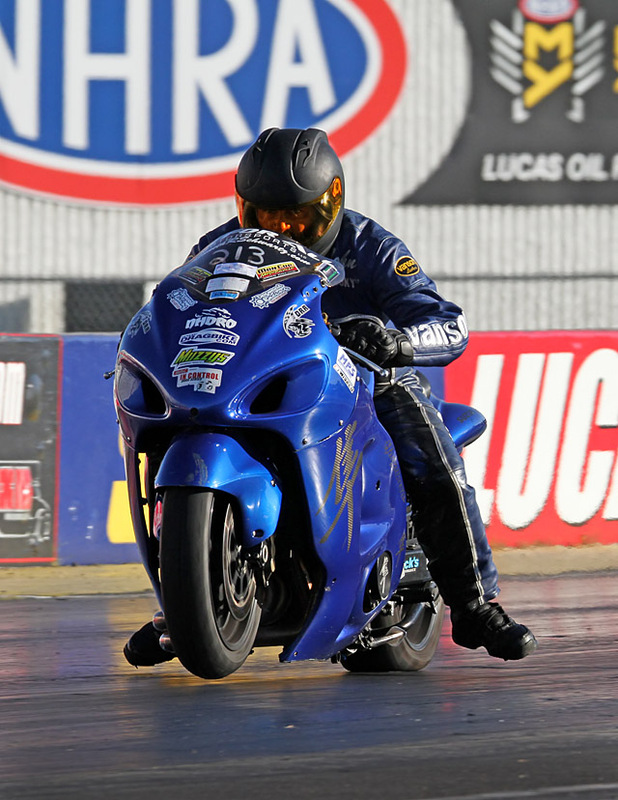 Dennis will be riding the “Venom” Suzuki GSXR1000 vs. LA on 8th Wonder in round one. MSP also fields Derrick “Squeak” Edwards’ “Clean Getaway,” which will have Thien Le aboard vs. Desmond “Kill Bill” Spaulding on Roger Starrette’s “Heartless.” You might remember Bill and “Heartless” from a vicious crash last November at the NHDRO World Finals. “Kill Bill” will also be riding “CT Fletcher” vs. Chris Moore on “Cash is King” in E1, and wouldn’t have to worry about meeting up with his “Heartless” until the final. Another two-bike rider is Lavar “Lil’ Charlie” DeLee on HTP Performance’s “Airwolf” and “Jizzle,” who race each other first round. Somebody’s got some decision makin’ to do! 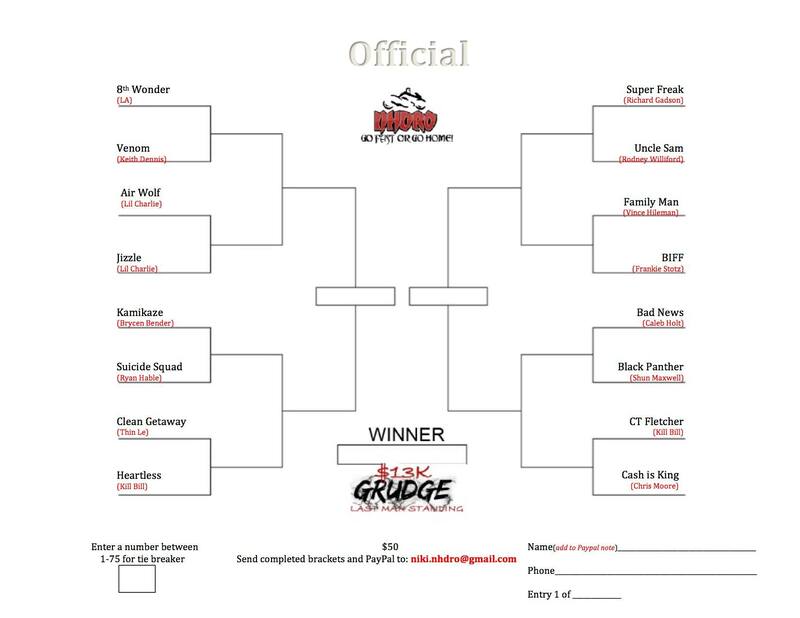 Even the fans have a dog in this fight as NHDRO is having a bracketology contest a la March Madness, so get yours and get in the game! Eight bikes that didn’t get their entry into NHDRO in time to make the draw of 16 will race their own mini bracket as well. It’s a hustler’s paradise! 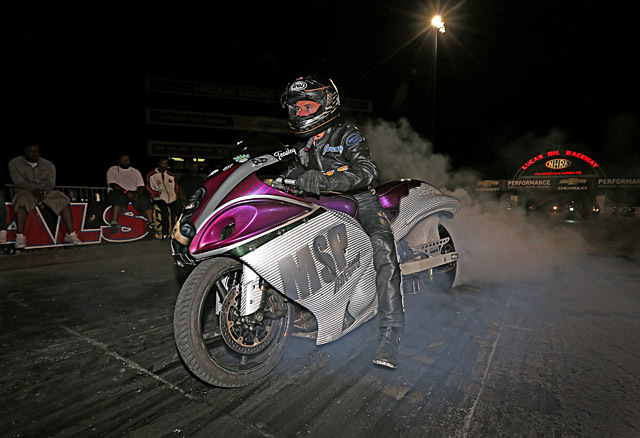 The world’s quickest street-legal bikes of McIntosh/Grayson Machine & Fabrication Pro Street kick off their season with their own $1000-to-win ND1 Prospect shootout on Saturday night. 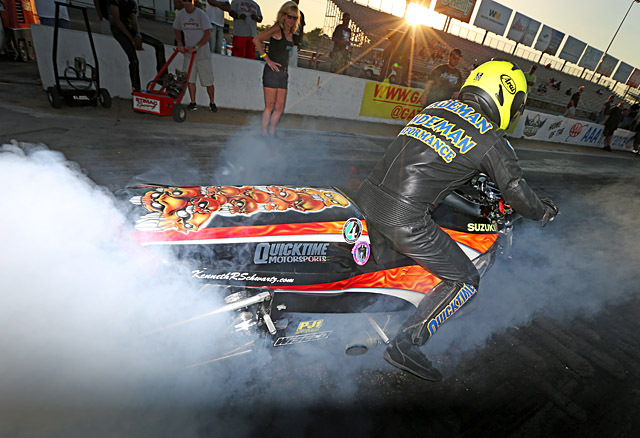 None other than legendary Rickey Gadson will be back chasing Pro Street glory, racing the same bike that Mark Paquette rode to the championship two years ago. He’ll be dealing with the likes of Quicktime Motorsports’ Rudy Sanzottera, Frankie Stotz and his little 1000cc Honda, former champ Doug Gall, Gabe Frederick, Jamie Lopes, Jeremy St. Julien, Brad Christian, James Herbert, Chris Klassen, and more as these 700 horsepower, turbocharged or nitrous-huffing street bikes unleash their fury. NHDRO will also be debuting their new class, which replicates the one that started the Pro Street revolution—Street Bike Shootout! Street tire, hand clutch, stock ECU and a weight-to-wheelbase ratio are what defines this otherwise unlimited class—and a road course test that ensures these beasts remain roadworthy. There’s nothing roadworthy about the big-tire, wheelie bar monsters of Pro Open. Champion Chris Cutsinger will start his defense against the likes of Ron Maddox, Leshon Norman, Charlie Theiss and more. 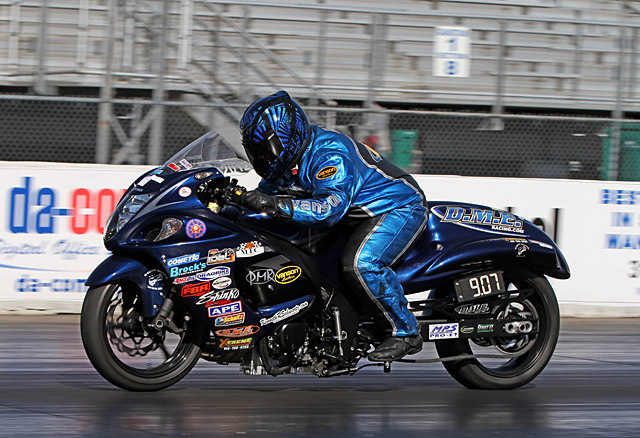 Will NHRA Pro Stock Motorcycle racers enter Pro Open in Atlanta? With their national event only three weeks later on this same surface, it only makes sense. and you’ve got Quicktime Motorsports/Lindeman Performance Pro Ultra. Class sponsor Jeff Lindeman, Dan McCarten and others will be vying to see who gets there the quickest—but not too quick. Top Gas 8.20 index class competitors carry it out to the full quarter mile. Last year, Jeremy Teasley became the first-ever Top Gas champion anywhere in the world who accomplished the feat on a street bike. He’ll have to defend against Kounselor Kenny Schwartz, Bradley Shellhaas, Greg Mallett, Joe “Big” Deck, Jeremy England, Heather Baldi, Mike Wagner and more. Multi-time dragbike.com BAMF Dustin “Biscuits” Lee has three(!) NHDRO championships to defend—M2.Shocks Crazy 8s, Millennium Trailers Super Comp, and Kevin Dennis Insurance Street ET. He’ll be battling against Ron “Ju-Jitsu” Arnold, Ken Selner, Cameron Teasley, Spencer Claycomb, Wes Brown, Stephen Knight and more. Penske Racing Shocks Street Fighter champion John “Spooky” Markham will face many of the same adversaries, and you’ll see Spooky run all those other Sportsman classes as well. Eric Cooper is the MPS Pro ET champ—a class raced by nearly everyone. Garreth Sheppeard, Darrell Carmichael, Jeremy England and Chad Isley are all regular players in Pro ET. 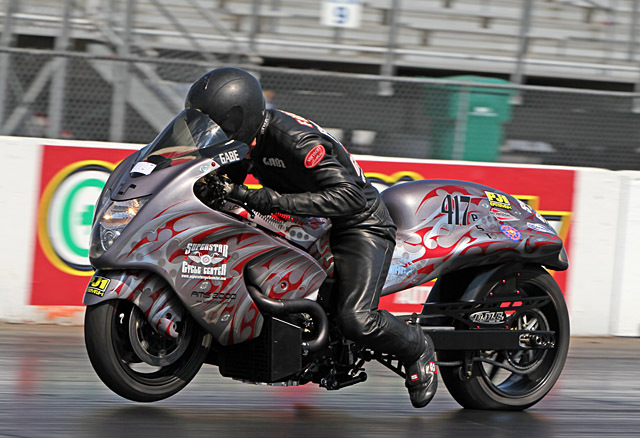 Atlanta will also see NHDRO’s first Grom race, sponsored by Total Racing Motorsports. 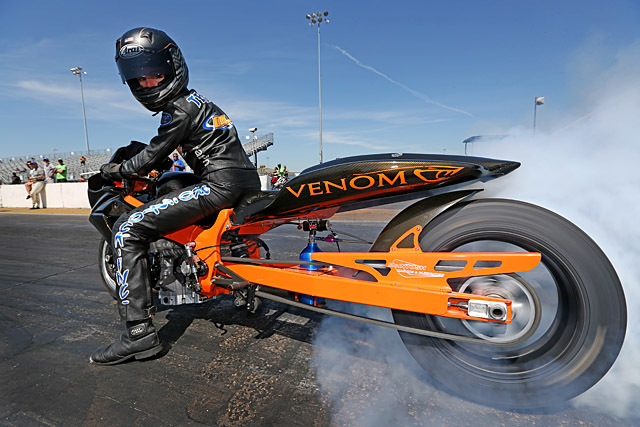 Jeremy Teasley on the Venom grudge bike. Schnitz Racing jumps on board as the Number One Qualifier sponsor, and of course NHDRO wants to thank Rob Bush Motorsports and 190hookup.com for their sponsorship of the event. Brian and Niki Welch look forward to welcoming all of the NHDRO family members—old and new—to this classic addition to the NHDRO schedule.